Here we bring you news of Seva carried out in two parts of India, literally at opposite ends of the country, from the States of Jammu and Kashmir and Tamil Nadu. Though separated by thousands of miles the Seva Dals are motivated by the same love and inspiration - that of helping the suffering and pleasing their Lord. Heart2Heart readers will be aware of the immediate response of Swami’s devotees whenever there are disasters affecting humanity. The Seva carried out by the Sri Sathya Sai Seva Organisation embraces those affected with the touch of Swami’s love, poured through His willing instruments. There can only be physical limits to the help that is rendered – His Love is everlasting and ever present. You may remember that there were torrential rains in Tamil Nadu in the months of November and December. 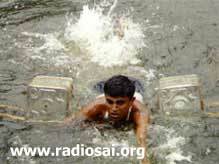 Thousands of people were suffering due to the flood waters. Into this situation entered the Sevadal teams, propelled to aid wherever, whenever and whoever they could. We would like to tell you of the Seva that was carried out mainly in the Chennai area, for your inspiration and interest. 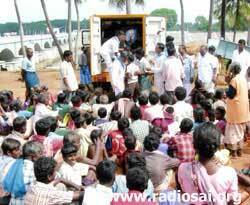 On 12th November 2005 over 600kg of rice was handed out in Vedachalam Nagar, Koyambedu, providing food security to 125 families. Two weeks later after flooding from the Cauvery and Coleroon rivers, 2200 people were served with food packets by 95 sevadals in 7 villages of Tanjore district. In an amazing rescue mission 15 youth members put their own lives at risk to save 20 people marooned in the swirling waters. 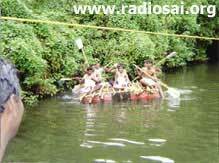 They constructed a raft using bamboo sticks and barrels, which was then able to cross the swollen surge and ferry the stranded back to land. This occurred in the Madipakkam area of Chennai Metro on 2nd December 2005. Another 50 people were cared for and given food at the Koyambedu bus station. In the next two days further seva was undertaken as follows. 1,200 people received food packets in the Choolaimedu area of Chennai Metro area, as the sevadals waded through knee deep water in dangerous circumstances to find the needy people in their very homes. 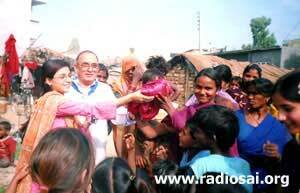 300 people received food and 100 sarees and 150 children’s clothes were given out at Bharani Nagar, Alapakkam. 100 people were given food at IDPL grounds, Nandampakkam and Bharathi slum, Nesapakkam. In the Adyar area of Chennai the Adyar River had burst its banks and created havoc for the surrounding residents. 40 youth sevadal distributed hot milk and biscuits to 300 homes in Mallikaipoo Nagar. Unmindful of danger they were forced to walk through knee deep water and use emergency lighting. Those who go to the aid of others are often neglected themselves. In such circumstances the Army was engaged in rescue operations in Kotturpuram and so our sevadal gave out hot milk and biscuits to their personnel. 1000 people who were sheltering in a school in the same area were attended to with hot milk, biscuits, Vibhuti and Swami’s picture. These details are only a summary in words of what transpired in desperate situations. Please bear the limitating factor of words in mind and take some time to contemplate on the real life feelings of the seva dal and those whom they went to help. 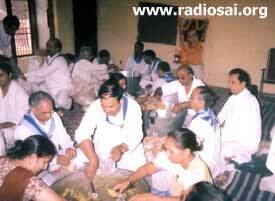 Of all the devotion and dedication, the sacrifice and joy, the sympathy and compassion that guided the seva dal. And the pain and anguish of those suffering, who found their lives lit up in their hours of need by service inspired by Sai. Some of the Seva dal involved in the above report have been trained in disaster management. These instructions become vital in life and death situations. You can see some of the training in these pictures. It was imparted at a 3 day intensive course near Tanjore. The topics include water rescue, rescue using ropes, first-aid training, cardio pulmonary resuscitation techniques and fire-fighting training. So far 500 seva dal have received disaster management training in Tamil Nadu. And some have gone on to become trainers themselves, even instructing people outside SSSSO! 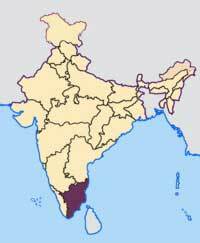 This article is based on our latest information from the state president of the Tamil Nadu Seva Organisation. Next issue we will be updating you with more such reports. The seva carried out in the state of Jammu and Kashmir has hitherto been somewhat subdued due to the risk to life from terrorist activities. 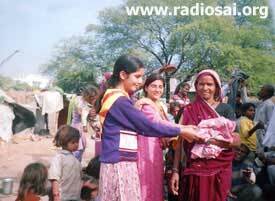 The mountainous and rocky terrain also makes the Seva undertaken a little more difficult than other parts of India. Yet the year 2005 was to be different as it was the glorious 80th advent year. 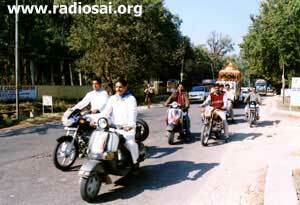 The Sai Organisation of Jammu and Kashmir was determined to ignore any personal risks and undertake Sai Seva. Narayan Seva in Kashmir Valley for the First Time! It was a significant moment for the Organisation when the Seva Dal members, undeterred by the spate of militancy related activities in Kashmir Valley, organized the first ever Narayan Seva on the eve of Bhagavan’s birthday when food packets were served to hundreds of people. Apart from the regular Narayan Seva that is carried out by the Organization every second Sunday of the month, Sai youth organized a special Narayan Seva on the eve of Bhagavan’s 80th Birthday. Food packets were served to the poor and physically challenged living in the outskirts of Jammu City, in Jhuggies (temporary houses). 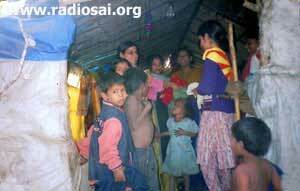 In addition to this, several Sai Youth visited a lepers’ home in the Bhagwati Nagar area of Jammu City, where delicious food was served to nearly 80 lepers. As a part of the Narayan Seva, Sevadals also distributed clothes to 530 people, including families with members suffering from leprosy and physical disabilities. Peace is such a rare commodity these days. 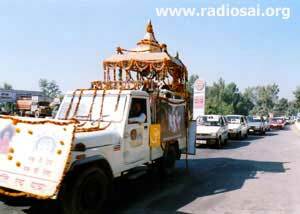 To promote brotherliness and harmony, the devotes and Sai workers had a “Shanti Rath Yatra” (A Peace March on The Chariot) in Jammu City during November 2005 to commemorate Bhagavan’s 80th Birthday. The “Rath Yatra” helped in creating awareness about Swami and His message of love and Service among the people. The Chariot was decorated with banners and was accompanied by cars decked with pictures of Swami and lead by six Sai youth on motorcycles. Akhanda Bhajan was also held for 24 hours, attended by 600 people in three locations. 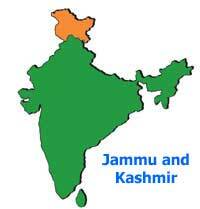 Many would be aware of the recent earthquake that hit the state of Jammu and Kashmir and even some areas in Pakistan. 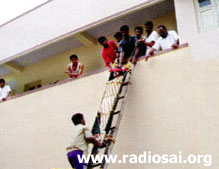 Many alumni from the Sri Sathya Sai Institute of Higher Learning rushed to the spot to help and aid the victims. There are really moving stories of servic and of love. We will bring you all these stories in the next issue of Heart2Heart. Watch out for the Cover Story of Feb 2006!